Believe it or not, I’m actually a fan of The Cars. Maybe not a HUGE fan (I don’t own Heartbeat City or Door to Door) but I like the early albums a lot. Though new wave music has some charm, it isn’t really a type of music I’ve ever listened to intently. Sure, I love the plethora of new wave hits that bombarded radio in the early ’80s like anyone else but I never cared enough to delve deeper into the scene. But yet… there’s something about The Cars that appeals to me. It’s probably the fact that while they are new wave, they aren’t strictly new wave. I think I would become very bored with them if they were only that. They combine power pop, rock, pop, hard rock and new wave into one nice package. A riff is just as likely to come from the guitar as it is from the keyboard and I honestly don’t think they receive enough accolades for just how good their music is. I’ve also always enjoyed Ric Ocasek’s vocals and lyrics. His vocals have always had this calm, cold almost disconnected feeling to them, as if he was simply an observer. Meanwhile, the meaning of his lyrics aren’t always clear (in fact, sometimes I think it’s just gibberish so it’ll rhyme but that’s par for the course in new wave) but I’ve always enjoyed reading along as the song plays. Well, what can be said about this album? First of all, it is it the first Cars album since 1987. The original Cars disbanded in 1988 but in 2005 a bit of an odd thing happened — The New Cars formed. Yet, it only featured Cars members Greg Hawkes & Elliot Easton and rounding out the band were Todd Rundgren and frequent Rundgren collaborators Prairie Prince and Kasim Sulton. The group toured playing a mix of Rundgren and Cars tunes but did release a live album called It’s Alive that featured a three new studio tracks but it was predominantly filled with classic Cars tunes (two Rundgren tracks also made the cut). I guess there was more money to be made cashing in on The Cars’ name than Rundgren’s. Well, The New Cars were done by 2007 and in 2010 the original Cars were back together (sadly, original bassist Benjamin Orr passed away in 2000). I’m not familiar with the details of this reunion. A Cars reunion had been rumored since the late ’90s but Ocasek always rebuffed such gossip and a part of the reason The New Cars formed is because he had no interest in doing such a reunion. So why now? I’m not sure. Whether it’s for personal or financial fulfillment Move Like This is no lazy effort. I have to think there’s more of an artistic than monetary reason for this reunion, otherwise I’m sure they could’ve floated by on the summer touring circuit just being a nostalgia act. But to record new and release new music? That exemplifies dedication and passion in this day and age in an industry that isn’t kind to aging acts… and is barely kind to the young ones! 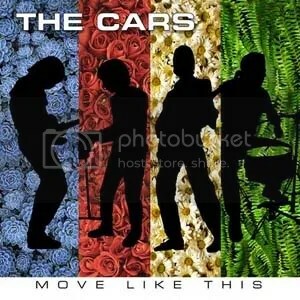 More about the album itself, as soon as it opens with quirky upbeat “Blue Tip”, you know you’re listening to The Cars. While it isn’t my favorite song on the album, it definitely sounds like something that could have come from the first few albums. To me, there’s no mistaking when you hear The Cars and that’s the great thing about this whole album — it’s like a lost Cars release! Even though this album still fits under new wave, because of all the other rock/pop influences I mentioned, it still has a timeless sound to it just like the band’s early releases do. Another great thing about The Cars are the ballads and they do not disappoint on this release. “Too Late”, “Soon” and “Take Another Look” are all fantastic moments on this album with “Too Late” being my favorite song on the whole release. The rest of the album is the usual high standard of upbeat sounding (if not lyrically) numbers we’ve come to expect from this band like “Sad Song”, “Free”, “Hits Me” and the aforementioned “Blue Tip”. Ric has crafted something really special with Move Like This. It is a more than worthy addition to the band’s catalog and if any of these songs get played in a live setting, they’ll fit in seamlessly with the rest of the band’s classics. Casual fans probably won’t even be able to tell these are new songs. Get ‘Move Like This’ at Amazon.com!